November brought some amazing opportunities and “firsts”, including delivering a Keynote Address at the OMEA / CMIEC Counterpoint conference, (click here for photos on my Facebook page), as well as our debut performance at the Aurora Cultural Centre, where we truly had a spectacular time with an outstanding audience. (Check out some pics from the night on my Facebook page HERE). More fun was had at the another Northlea United Jazz Vespers, as well as the annual “Christmas with the Choir” event at MCC Toronto, and during Broadsway’s return to Aeolian Hall in London. I’m also very excited to announce that I’ve written, recorded, and released a tune for the season: “Santa’s On His Way”! My pal Diane Leah and I wrote words and music for this little gem, and then headed into the studio to record it with our friends Ross MacIntyre, Ben Wittman, and Colleen Allen. The tune is available via Apple Music, Spotify, and most major music streaming / subscription services. You can also check out the wee “behind the scenes” video we made HERE. As for shows during for the remainder of December, we’ve got a few good ones in store, including Broadsway’s return to the Richmond Hill Centre for the Performing Arts for our Holiday show: “The Most Wonderful Time … Maybe”. If you haven’t already booked your tickets for this show, you’re out of luck, as it’s sold out. For those of you eager beavers who DID book your seats, you’re in for a treat! I’m very excited to be a part of this series that features lots of music, chat, and fun. We’ll be adding some seasonal tunes with our usual fare and I’ll be sharing the stage with my pals Michael Shand and Mark Godfrey. For information on these and other upcoming performances, please visit the SHOWS page of my website. With the rush of the Holiday Season upon us, I hope you’ll take some time to enjoy visits with family and friends, and perhaps take in some live music, as well. As artists, we appreciate the support, and love the opportunity to share our music with you. Plus it’s a great way to spend time with those close to you and do something a little different for this year’s Holiday Hangs! Also, for those music lovers in your world, please consider giving the gift of music this year, with tickets for upcoming live performances, or by purchasing a CD or download (which can be found via the MUSIC page on my website). This past year has been one full of highs and lows, accomplishments and struggles, just like any other year. Through it all, it’s been the opportunities I’ve had to meet and perform for you that have stood out to me as some of the sweetest moments of the year. I thank you very sincerely for your continued support in every way that you’ve given it, and I look forward to our paths crossing again in the coming year. I wish you, and those you love, a very Merry Christmas, Happy Holidays, and all the best of the Season. Here’s to health, happiness, love, fun, and blessings in 2019. Again, I thank you very much!! P.S. – If you haven’t already done so, please sign up for my monthly newsletter, so you’ll remain “in the know” about upcoming shows and events. You can sign up by clicking HERE! And if you’d be so kind, please pass this note along to your friends so THEY can sign up for these e-newsletters, too. The more the merrier! Imagine all the things you’ll have to talk about then!! Yes, there’s another piece added to the Holiday Musical Landscape! Heather and colleague (and fellow Broadsway “Broad”) Diane Leah have written and released “Santa’s On His Way”: a light, playful look at various aspects of the holidays. Both the sentiment and the swing are well in play on this soon-to-be Christmas Classic! For a little taste of the fun, you can listen to the tune and check out a wee “behind the scenes” video from the recording session HERE! “Santa’s On His Way” has been submitted to radio stations across Canada and in the US just in time to be added to Holiday playlists. If you’d like to hear it over YOUR airwaves, contact your local station and request it! We hope you enjoy “Santa’s On His Way” and share it with your friends! As always – THANK YOU for the support! From all of us, Merry Christmas and Happy Holidays! I’m very excited to announce that I’ll be releasing a new recording next year – in late Spring / early Summer 2019! We’re currently busy in the pre-production / planning stages for the new project and it’s coming together very nicely! This record will have more of a “home grown” feel to it, including some material from incredible Canadian songwriters, as well as more original material. The past year has been one full of ups and downs and I have to say that the inspiration for creation has been strong. I hope you enjoy what we’re putting together! Special thanks to FACTOR (The Foundation Assisting Canadian Talent on Recordings) and the Ontario Arts Council (OAC) for their tremendous support! It’s wonderful organizations like this that allow us independent musicians to continue practicing our craft and producing our art . I can’t thank them enough! Please stay tuned for information about the new recording, as well as the shows we’re planning to support it! So, Autumn is officially here! For all of you who enjoy a break from the humidity and sweltering heat – this is your month! (Then, again, with climate change being what it is, all firm bets are off!) In any event, ’tis the season for Pumpkin Spice EVERYTHING, so you can relish in that! September was a whole lotta fun for us, and it was great to see so many friendly faces at the shows we did. Highlights included Broadsway’s Homecoming show at MCCToronto, the rather brilliant fun I had with June Garber at the Kensington Market Jazz Festival, and returning to my Hometown for a visit with family and friends and a couple of performances at the Wreckhouse Jazz and Blues Festival. Click here for a few pics of September events. In other areas, I received the fantastic news from The Ontario Arts Council and FACTOR (The Foundation Assisting Canadian Talent on Recordings) that I’ve been approved for some financial support for my new recording! So, stay tuned for a new recording project coming out in 2019. It’s going to feature a LOT more Canadiana, including some of my own music and that of some friends, so I’m really looking forward to getting into the studio soon! I have to offer tremendous thanks to OAC and FACTOR for their support. This sort of assistance is crucial for independent artists like me, and I’m tremendously grateful for these (and other) organizations and all that they do! October is looking good when it comes to fun and great music, with a guest appearance at The National Club’s “Salon Series” (Toronto) and the honour of being Artist-in-Residence at the Steel City Jazz Festival in Hamilton – where I’ll also be making my debut! Alan has once again assembled a terrific group of musicians for this very special evening as part of the National Club’s “Salon Series”. I’ll be joining Alan’s ensemble of musicians (Eric Boucher, Paul Intson, and Rick Gratton), as well as special guests Paul Hoffert and Bruce Cassidy. (NOTE: This is a private event, but open to members of the National Club and their guests. I am honoured to be this year’s Smordin Law Artist-In-Residence, and to make my debut, at the Steel City Jazz Festival! Joining me for this performance will be Adrean Farrugia, Ross MacIntyre, and Colleen Allen. One of the benefits of being this year’s Smordin Law Artist-In-Residence at the Steel City Jazz Festival is bringing my pals from Broadsway (Diane Leah and Julie Michels) with me for this show! So, that sums up October performances. It’s not too busy, which will allow me spend some time with my folks (who’ll be visiting me from Newfoundland – yay!) as well as to continue working on tunes for the new album. It will also allow me to take advantage of some quiet time and enjoy Thanksgiving (here, in Canada), so that I can truly reflect on my good fortune and offer up the thanks necessary to remain grounded and humbled. I always say that without the people in my life who support what I do, there’s NO way I’d be able to do ANY of this. All of you allow such good things to happen for me, with your support and best wishes – whether it’s coming out to shows, or even just taking the time to read these e-mails. It means the world to me that you’re there, so this Thanksgiving, I’ll be raising a glass in a toast to you and your loved ones! May all of us always be truly grateful for our many blessings … just as I’m grateful for you! For more information about these and other shows, please pay us a visit at the SHOWS page of my WEBSITE so you can find out where we’ll be next and hopefully make a plan to join us! If you haven’t already done so, please sign up for my monthly newsletter, so you’ll remain “in the know” about upcoming shows and events. You can sign up by clicking HERE! And if you’d be so kind, please pass this note along to your friends so THEY can sign up for these e-newsletters, too. The more the merrier! Imagine all the things you’ll have to talk about then!! In the meantime, thank you – again – for the support. Be well, take care of yourselves, and I look forward to seeing you soon! 2019 will see a collection of some of Canada’s finest Jazz artists coming together to form an all-star group for several shows, beginning in January. Members of the ensemble include world-renown flugelhorn master and Officer of the Order of Canada Guido Basso, multiple JUNO-award winning saxophonist Mike Murley, internationally-recognized bassist and Officer of the Order of Canada Dave Young, JUNO-winning piano phenomenon Robi Botos, multi-faceted and in-demand drummer Davide DiRenzo, and JUNO-nominated vocalist Heather Bambrick. This collection of highly respected members of the Canadian Jazz establishment will wow audiences in three shows planned for early 2019: January 23 at the First Ontario Performing Arts Centre in St. Catharines, January 24 at the Flato Markham Theatre in Markham, and January 25 at the Grand Theatre in Kingston. There are more shows to be announced later in the year. For more information regarding this group, contact Robert Missen at the Bobolink Agency. You’ll Never Know continues to draw attention and accolades, and now features a brand new video! Hot on the heels of a 2018 East Coast Music Award for Best Jazz Recording, and a 2017 JUNO Award nomination for Vocal Jazz Recording of the Year, the official music video for the re-imagining of Bruce Cockburn’s pop-rock classic “Lovers In A Dangerous Time” is released. The video was shot and directed by Carlos Coronado, and features performance by the Heather Bambrick Quintet, as well as the stories of four individuals making their way through day-to-day life – and making connections at the same time. The visual narrative brought out in these characters and their stories also serves to highlight Cockburn’s beautifully poetic lyrics. Stay tuned right to the finale for a poignant and perhaps even “surprise” ending! Shot in the streets and neighbourhoods of Toronto, viewers will catch several familiar landmarks, as well as some familiar faces, including those of Colleen Allen, Adrean Farrugia, Ross MacIntyre, Ben Wittman, Clifford Frimpong, Sam Lonen, Prasanna Mondal, and Emily Shem. Here’s the official music video for Heather Bambrick’s recording of “Lovers In A Dangerous Time”. 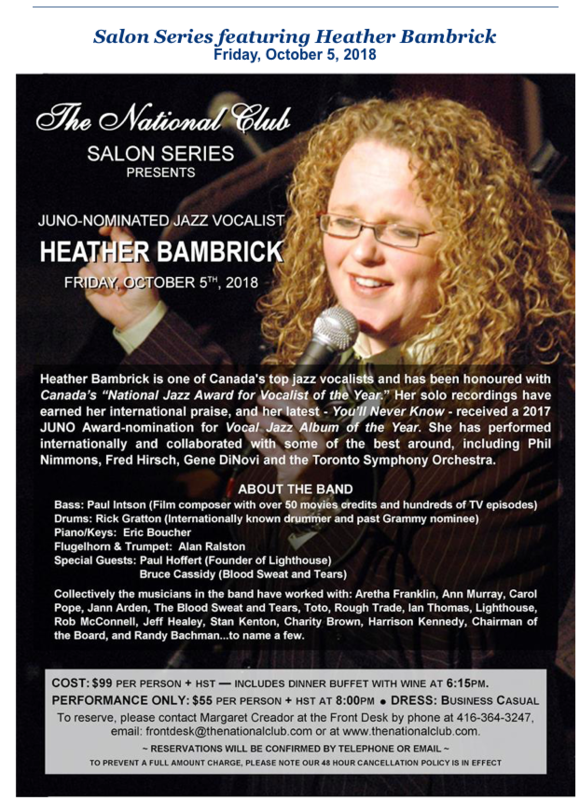 Heather Bambrick and Friends returns to the TD Toronto Jazz Festival as part of the “Festival Within The Festival”. This year’s series features some of country’s top legendary Jazz talents, as well as outstanding artists that Canada has exported south of the border. The series takes place over four nights at the Home Smith Bar at the Old Mill, Toronto, and all four shows will once again be under the musical direction of the incomparable Russ Little, along with his phenomenal musicians: Tom Szczesniak (piano), Scott Alexander (bass), and Brian Barlow (drums). The 2018 line-up of “Friends” may very well be one of the finest since the series began, and is sure to cause tickets to sell out quickly! All shows begin at 7:30 pm at the Home Smith Bar, in the Old Mill, Toronto. Festival tickets are on sale now at Ticketpro.ca or by calling 1-888-655-9090. There are no reserved seats; ticket-holders will be seated at the Home Smith Bar on a “first come, first selection” basis on the night of each show. Home Smith Bar doors will open at 6:30 pm. For more information on the entire series, visit www.torontojazz.com. This is sure to sell out very quickly, so don’t wait! Get your tickets ASAP and don’t miss this incredible line-up of world-class entertainers! Heather is hitting the road in May, joining musicians on Canada’s East and West coasts … starting with the East Coast Music Awards! Halifax, NS, will host one of Canada’s biggest music parties, as the city welcomes the 2018 ECMA conference, including several showcase performances and the awards, themselves, happening on Thursday, May 3. On Friday, May 4, Heather will launch showcases on the Jazz Stage at Lot Six Bar and Restaurant. Joining her will be a crew of East Coast Jazzers, including fellow nominee Florian Hoefner (piano), Tom Easley (bass), Martin Davidson (saxophone), and Mark Adam (drums). The show begins at 8:00 pm and admission is free. For more information, visit www.ecma.com. For more information on these performances and more, visit the SHOWS page on Heather’s website. You’ll Never Know Nominated for East Coast Music Award! On Monday, January 29, the East Coast Music Association announced the nominations for the 2018 East Coast Music Awards and I am thrilled to announce that You’ll Never Know has been nominated for Jazz Recording of the Year. This is a very special honour for me, personally, as the ECMAs pay tribute to East Coast musicians and their music, so to receive this sort of recognition from my “Homeland” is pretty darned great! I’m also delighted to be in the same category as these other brilliant musicians. Some of them – like Florian Hoefner and Paul Tynan – are people I’ve worked or performed with in the past, and I’m truly a fan of theirs. The others are artists whose music I’ve recently discovered and appreciate immensely! It’s certainly a broad (and tough) category, and I’m honoured to be a part of it! For a full list of nominees in all categories, click HERE. This year marks the 30th Anniversary of the ECMAs which will be celebrated in Halifax, NS, from May 2-6, 2018. The awards, themselves, will be handed out on Thursday, May 3rd, in a ceremony hosted by Jonathan Torrens and featuring performances by Sloan, Rose Cousins, The Once, The Barra MacNeils, and more. You can watch the festivities live as they happen on Bell Alliant Fibe TV1, or at ECMA.com.